The Dodecanese island of Leros is not what standard holiday makers would see as an obvious choice for a Greek holiday. At first sight this Dodecanese Island appears rather uninviting. Looking at the coastline of Leros from a ferry boat, most people fail to imagine how beautiful this Greek island is once you get to know it. The vegetation on Leros is rather sparse in general, but there are many hidden areas that are fertile and green, and many beautiful little bays as well. Leros is different in that unlike the other Dodecanese Islands it does not rely on tourism. It is not particularly easy to get to, and in terms of accommodation the choice is limited, but Leros is representative of typically modern-day Greek island lifestyle. Most restaurants and bars are open all year including the winter months, and are newly refurbished and spotlessly clean almost without exception. Leros is rather a posh Greek island. Apart from the amazing infrastructure this Dodecanese Island doesn’t have much to offer for holiday makers who like sight-seeing or are keen to explore. 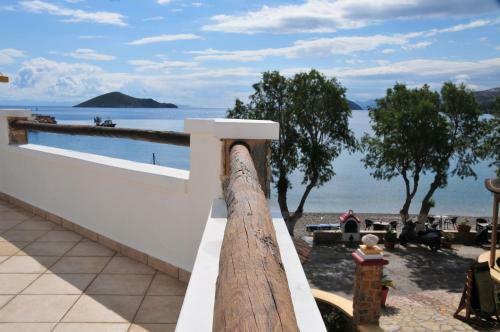 Leros is for those who want to recharge their batteries and simply enjoy the beaches and the relaxed Greek lifestyle. There are some nice places for going out in the evening as well, last not least for the benefit of local youngsters who like their entertainment. The best way to travel to the Dodecanese Island of Leros is via Kos and Samos. The largest towns/villages on Leros are Alinda, Agia Marina and Panteli. The port of Lakki is a suburban estate that seems to clash with the rest of the island’s architecture. Agia Marina is a nice starting point for exploring the Dodecanese Island of Leros. There is a big choice of bars and tavernas and prices are very reasonable. Agia Marina is not just for tourists, as many locals live there as well. The tourist infrastructure is perfect, but it is recommended to hire a car to get to the other attractions on the island. Alinda is the main tourist resort of Leros, but apart from practical things such as accommodation, restaurants and bars, together with a beautiful bay and attractive beaches, it doesn’t have much to offer. It does have a beach, though, and car-hire places for tourists who want to get around on the island. Lakki is the main ferry port of Leros, but otherwise not attractive for tourists. Accommodation and beaches in other parts of the island are much nicer, although Lakki is a good place for shopping. Panteli is the resort on Leros with the prettiest harbour, a massive fortress and a perfect view of the famous windmills on Leros. Panteli has a limited choice of accommodation, but there are a lot of entertainment options and the best fish taverns on the entire island. The most beautiful beaches of Leros are easily accessible from Panteli too. Partheni is a tiny settlement in the north of Leros. This is where the island’s small airport is situated, and there are some very attractive bays there as well. For those who want a restful holiday, Xirokambos is just the place, with a pebble beach, a few taverns, very nice accommodation and good restaurants. That’s it, though.